Panoramic views, picture-perfect architecture and punchy local produce: our dining options showcase the best of the region. Break bread on the vine-covered terrace of La Loggia or step into verdant gardens for a sundowner. Where menus sing with seasonal flair, Belmond Villa San Michele boasts some of the best restaurants in Florence. With its 15th-century setting and refined Italian cuisine, few restaurants in the world are as romantic as La Loggia. The picturesque arched terrace perfectly frames Florence stretching off into the distance. Dine alfresco in the sunshine or in one of the historic rooms inside. For private banquets, the Ristorante Antico and Cenacolo rooms will take your breath away. This glamorous, fully-refurbished bar is the perfect spot to relax while sipping delicious signature cocktails. Ask our internationally acclaimed barmen for a timeless Negroni, or a refreshing Chartreuse Swizzle. Set in the hotel’s historic Cloister, the bar’s design balances tradition, soft contours, leather, brass and marble with flashes of modern sophistication like the leopard-print cushions adorning gold-highlighted sofas. Dine deliciously in our gardens with this special menu, one of many ways we celebrate the 500th anniversary of the true Renaissance Man. 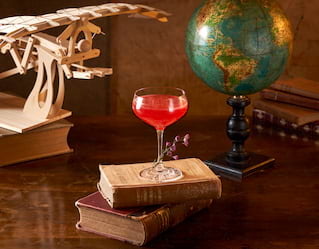 This unique culinary journey is inspired by Leonardo da Vinci's “Codice Atlantico”. Dishes tells the story of Florence’s culture; a city that has always been ahead of its time. They are served on a stand that is inspired by Leonardo’s famous flying machine. With Florence a breathtaking web below, our hilltop Pool Restaurant and Bar is tempting at any time of day. Enjoy the cool mornings with a coffee, take a shaded seat on the terrace for a lazy lunch or toast the day’s adventures with a poolside sundowner. Bursting with lemon trees, rose bushes and herbs, our fragrant gardens make an idyllic setting for a cool glass of wine with friends. As blue skies deepen and night falls, be drawn by the soothing sounds of live piano for a relaxing alfresco nightcap. Open over summer from 2pm–10pm, with live piano music from 7pm. Ask about exclusive reservations for private events. Soak in sumptuous views as you enjoy lunch or a light snack beside our inviting swimming pool. Step out into our beautiful Italian gardens and slowly savour a cocktail alongside sweeping views of Florence. The idyllic setting of Belmond Villa San Michele makes for memorable celebrations, meetings or small VIP gatherings. Treat your guests to a tailor-made menu of delicious regional cuisine in one of our exceptional venues.